The Glenwood Springs High School Design/Build program aims to help students discover their potential in an academic sense as well as a practical one. We encourage the vision of our students in a unique way. What once was just an idea, becomes a set of plans, and then after a plethora of learning experiences along the way, a realized project. This website is intended to explain the concepts and design choices Design/Build 2 students at GSHS and I have made with regard to the tiny house we will soon begin constructing. The project is intended to be auctioned off to a teacher in need to help alleviate our valley’s housing crisis. The tiny house will be built upon a 40’ trailer and will have built dimensions of 35’ x 8’6”. The additional 5’ extension on the back will have a permanent deck that will house the grilling area. On the south façade an operable 6’ deck will have the ability to fold down and lock in place. When deployed, the deck will essentially double the available living space during warm weather. Our donors below have graciously provided us with the materials necessary to get started. We are also currently in search of donations to help lower the cost of the build for the teacher who will be the eventual owner. A list of donations we are in need of can be found at the end of this post. Our huge 5’x6′ window will be transformed into an aquaponic growing station. 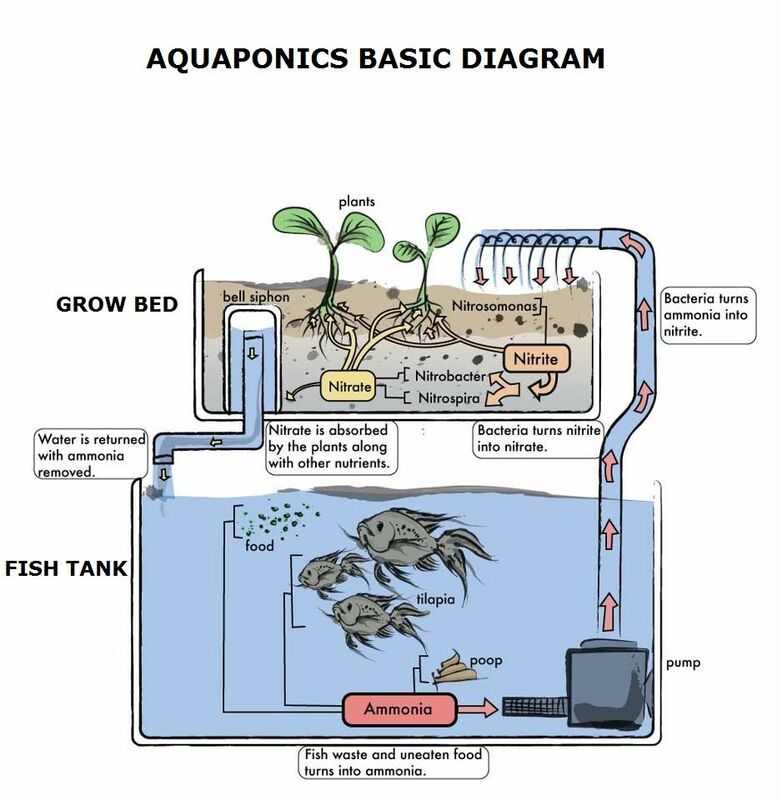 Aquaponics is a closed loop food production system where the waste excreted by fish provide the nutrients for plants via their breakdown from microbacteria. In turn, the plants filter the water allowing the fish to thrive. The loft level will be accessible by what we are calling a “net loft”. The loft will allow light to filter through to the spaces bellow while keeping the upper level accessible for storage and as a hang out or stargazing space. Awning style windows with their hardware removed will allow us to use two mirrored fold out tables. During warm weather, people on both the outside and the inside will be able to communicate freely as well as share drinks and food. A cutout at loft level allows eastern morning light to reach the kitchen area below the loft. The living room space is designed to fit a fold down projector screen, turning it into a mini movie theater. In addition to the screen, the living room space will feature an Ikea section that folds out into a full size bed for guests. Seating has also been designed to hold the freshwater tank. While we have begun our journey, we are still in need of a substantial amount of donated items. Every donated item we receive makes the purchase price more accessible for one of our local teachers. If you have the ability to provide or donate any of these materials please contact Steve Eaton at steaton@rfschools.com. I hope that you are as excited about the project as we are. If you would like more information please see the design brief in PDF form linked below.